I decided to experiment with this neck and I ordered it with a 1 5/8″ nut. Having played this for a while now, it is too narrow for me. All my other guitars are bigger: my electric guitars are 1 11/16 and my acoustic is 1 3/4″. I never expected to be able to notice a difference of 1/16 of an inch but it is very noticeable, especially at the top of the fretboard where it feels very cramped, especially for barre cords on the fifth string, where some of my fingers seem to sometimes hit the wrong strings. What can I say about the Warmoth neck? It was a thing of beauty. It fit the body perfectly, the fretwork seemed first rate, it came almost perfectly flat, it had the very useful Gotoh truss rod side adjustor, and it looks great. It is a totally first rate piece of work. Warmoth rulz. Also, I must say I really like the compound radius neck. The way it manifests itself to me is in a lack of fret buzz when noodling around halfway down the neck. Finally, it was much easier than I expected to do the neck/string setup on the Frankencaster. I had never done my own setup before (blush) and I was half expecting that I would end up needing to take the guitar to a professional luthier to get it working but I seem to have set it up well enough for me to be satisfied. So yay for me! There are a few things not so great about this body. The first is that the finish is pretty fragile and brittle. I mentioned that I’d chipped the body in an earlier post but what I didn’t mention was that every single time I drilled a hole in the body, I chipped all kinds of finish around the drilled hole. It hasn’t mattered because every drilled hole so far was hidden by something larger going over top but it did make me very anxious every time I had to work on the body. Currently I am leaning toward #4. Which is put it in a garbage can and light it all on fire. No, I’m kidding. I am leaning toward #3. What’s so great about this body? I love the color. I love the dual humbuckers. I love having lots of knobs. that the style of guitar I built, with the four volume/tone pots in a small cavity and specific channels for the wiring made for a very cramped implementation and it was not easy to repeatedly take off and put on the pickguard. Working with shielded cable is a nightmare and I clearly don’t understand how to do it properly. I ended up shorting out 2/3 of my shielded cables inadvertently and having to do the wiring twice, the second time ripping out all shielded cable and replacing it with standard wire. The Seymour Duncan humbuckers sound AWESOME! I really feel they capture the Gibson LP tone I was seeking – hardy, metallic, crunchy. I am positive that if I could play like Jimmy Page, I would have his sound through my amp. I have the 59 in the neck position and it sounds especially fabulous. Another thing which worked out well is the level of hum I hear. I spent a lot of time trying to shield the guitar’s body cavity in the hopes that it would pay off in reduced him. I would say without any hint of pride or exaggeration that my Frankencaster has significantly less hum than this factory Fender model. Also, the Seymour Duncan humbuckers sound ten times better than these Fender ones. Finally, my wiring diagram! It worked out of the box and it works fabulously well. Pretty basic: the shielded cable was a problem and the tight body cavity spaces made this a somewhat challenging project. The goofy precision straightedge – I am finished the guitar, I have done a full setup and I still have not used this $55 ruler. 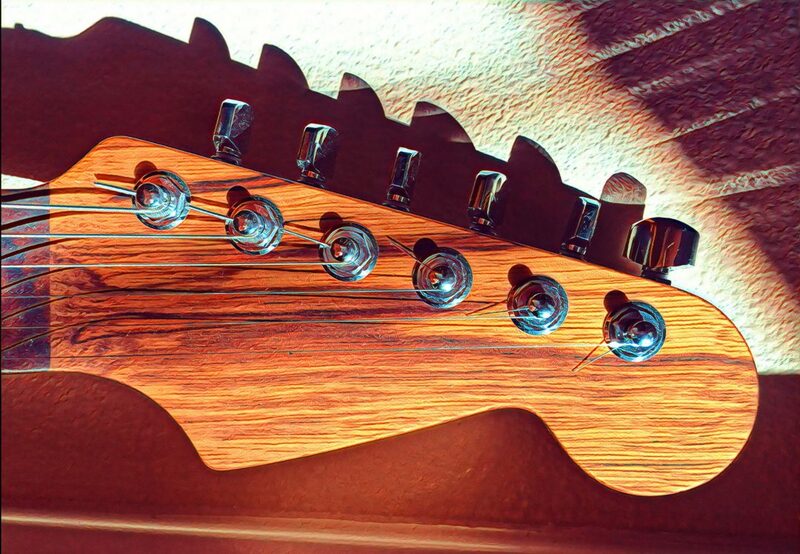 The FretGuru2 is awesome – very easy to measure string heights. The screwdriver kit I bought from StewMac is more than awesome – it was indispensable. It doubled as a punch, it had specialized driver ends, it had every conceivable size, and I could go on and on. It is a must-have tool for me. Also, another must-have tool – the digital caliper. I kept finding myself wondering things like how big was a specific guitar string or how wide was the neck nut or what size wrench I needed to buy and the digital caliper just came in handy time and time again. Finally, my Bosch drill! This is the first drill I have used with a LED right above the drill bit and wow was that ever handy! Touch the trigger and suddenly everything lights right up. Very helpful. Well first I need to figure out how to fix my Frankencaster strap holder debacle. But assuming I can fix that, I think I will build another guitar. I want to build another Telecaster but I think this one will be more traditional – single coils front and back – but it will have a few twists. For one thing, I don’t want to use a pickguard at all. For the rest, you’ll need to wait and see in the coming blogs posts. As usual, feedback is welcome. Previous: Previous post: Power on #2, so much!